Brethren, be watchful, stand firm in your faith, be courageous, be strong. Let all that you do be done in love. 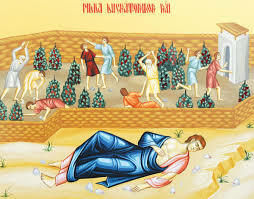 Now, brethren, you know that the household of Stephanas were the first converts in Achaia, and they have devoted themselves to the service of the saints; I urge you to be subject to such men and to every fellow worker and laborer. I rejoice at the coming of Stephanas and Fortunatus and Achaicos, because they have made up for your absence; for they refreshed my spirit as well as yours. Give recognition to such men. The churches of Asia send greetings. Aquila and Prisca, together with the church in their house, send you hearty greetings in the Lord. All the brethren send greetings. Greet one another with a holy kiss. I, Paul, write this greeting with my own hand. If any one has no love for the Lord, let him be accursed. Our Lord, come! The grace of the Lord Jesus be with you. My love be with you all in Christ Jesus. Amen. Beheading of Saint John the Baptist. Orthros and Divine Liturgy.